it is hidden from Him, but all are in a clear record. A very small particle of matter is called “zerre”. With this verse, the attention is drawn to the small particles of matter. A naked eye looking at a table, a carpet, a wall or a stone can neither fully grasp the importance of the atom, nor the knowledge it contains. We can assume that the Quran, while stressing the importance of these small particles, in addition by using the expression “something smaller,” also emphasizes the importance of particles smaller than the atom. With the expression “greater than,” we believe that it attracts attention to the components like molecules. Men contemporary with the Prophet could not possibly have known that the smallest particle of the matter, the fragments, and the components of matter could have significant importance. Quran’s drawing attention to the atom and subatomic particles is relevant to the present day information that physics has reached. Another miraculous sign of the Quran is that whenever an attention is drawn to small particles with the word “zerre,” their weight is also mentioned by the Arabic word “misqal.” As we know, atomic weights are very important for the study of atoms. The entire universe is made of matter or energy. From the trunk of a tree to its leaves, from the hands of a human being to his eyes, from golden ornaments to cotton dresses, everything is matter. The atom is the individual structure that constitutes the basic unit of any chemical element. The proton is an elementary particle that is the positively charged constituent of ordinary matter, and, like the neutron, is the building stone of atomic nuclei. The electron is an elementary particle that is the negatively charged constituent of ordinary matter. These are the recent discoveries of science that led us to the discovery of the television, computer, internet, etc. Take, for instance, a grain of sand in your palm, which is assumed to be the simplest matter, and think of the millions of atoms it contains. Imagine that each of these atoms has its electrons moving around the nuclei, like the planets making their rounds around the sun. An intelligent mind will readily conceive that there is nothing simple in the universe. Be it a pizza or a rock, suppose that you fancy recomposing them. To embark on such a huge project, you must go back to the very beginning, to the primeval explosion, and repeat the process. In this odyssey, you will run into atoms, cornerstones of the universe, entailing the existence of protons, electrons and neutrons; then you will be faced by the gaseous substance made of hydrogen and helium; these will be followed by stars and atoms produced in these stars which will one day be transformed into the mushrooms, cheese and tomatoes of our pizza. In order to really make a pizza, we need to create the entire universe with all the stages it had. The more you delve into the study of the atom the greater becomes your wonder. Suppose a penny on the table is the nucleus of an atom. The orbit that the electron would trace around it would be at a distance of 2-3 km. What is in between? The distance between the two, i.e., the nucleus and the electrons, is a vacuum. In other words, a piece of rock held in our hand contains in it trillions of solar systems, but 99% of it is a vacuum. Interesting, isn’t it? God’s power is demonstrated through more than one hundred million galaxies, more than a hundred million stars contained in each, countless planets and satellites and their quadrillions of devised orbits. A grain of sand, then, contains millions of miniature replicas of the solar system where electrons dance around the nuclei of millions of atoms. What should one deduce from this? To begin with, the incommensurable magnitude of our Creator’s power is also observed in the depth of matter. Endless vastness has been created from these particles. The Author of that speck of dust is also the Author of the universe. All these phenomena point to the immensity of His power and to the order reigning in the universe, as well as to the fact that nothing is casual in His creation. The creation of the smallest and of the biggest is equal for Him. The creation of a point containing trillions of atoms and of immense space is equal for Him and difficulty is a notion not applicable for Him. There is no limit to His wisdom and power. 27- And if all the trees on earth were made into pens, and the ocean supplied the ink, augmented by seven more oceans, the words of God would not run out. God is indeed Almighty and Wise. 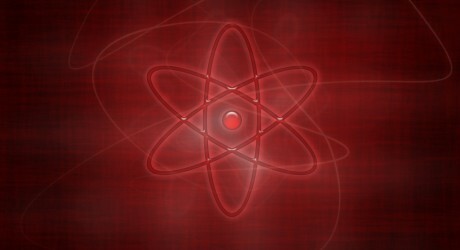 The nucleus of the atom contains protons charged with positive electricity. These positive charges repel each other. The miracle of creation occurs when protons adhere to each other forming a single point. The power that confines the protons repelling each other and the neutrons within a single point is immense; it is called strong nuclear force. The elementary particles containing this force are referred to with the French epithet “gluons” meaning “sticky” (The immense destructive energy of the atomic bomb was obtained by the use of this force). God, who devised everything in the universe with mathematical precision, has also conceived this immense force with mathematical exactitude. This force adheres the mutually repelling protons to each other; had the power been weaker or stronger, the protons could disintegrate or it could cause the intrusion of protons and neutrons into each other. The atomic bomb demonstrated tragically the immense power of the atom. It also showed that one of the factors that contributed to our worldly existence is its intrinsic balance. Thanks to the well-adjusted order reigning in this field, matter does not disintegrate all of a sudden, giving rise to noxious effects of radiation. Another important factor that contributes to the stability of the atom is the weak force inherent in it. This force is particularly important in establishing the balance of the nuclei that comprise an excessive number of neutrons and protons. Electromagnetic force is another factor contributing to the existence of atom. It is this force that brings about the attraction of oppositely charged particles and the repulsion of particles having like electric charges. This has made possible the coming together of the protons and electrons. However, this coming together has its limits. Electrons do not stick to the protons while they move at a breathtaking speed around the nucleus in their orbits. The repulsion of negatively charged electrons turning in succession, and the attraction of the electrons by the protons changes nothing. In this way, the electron does not stick to the proton that attracts it, nor is it moved away. The Creator of this system, of these electrons, deprived of consciousness, is undoubtedly the Creator of matter, atoms, electrons, etc. Let us make an experiment as conscious human beings. Imagine tying a rope around the waists of three or four people while others stand in the middle of the circle. Let those in the middle try to pull the tied people towards themselves while the outside people are circumnavigating the center, and let the people making the circle push each other and those in the center as well, resembling the movement within the nucleus of an atom. We certainly do not expect them to make thousands of rotations per second like an electron. Can reasonable human beings continue to imitate the motion of an atom for the length of one minute? And imagine for an instant that we venture to imitate the model of an atom with 3 or 4 orbits and that there are three or four rotations around the symbolic nucleus. In addition to this, suppose that sumo wrestlers representing the gluons with adhesive properties within the nucleus try to keep those pulling the rope while pushing each other at their places. What an awkward experience this would be! How have the protons and electrons been performing this feast over and over again endlessly for eons and eons with the trillions of atoms contained in a small rock? These atoms existing in the universe and in our bodies were produced long ago in supernovas. The calcium in our teeth, the carbon that our pizza contains, and the iron atoms in our body are products of stars of high temperatures. These raw materials of the universe are prepared in the laboratory of these stars before being transformed into pizzas, water, blood, flesh, teeth and eyes. This is not a story of an adventure taking place far away from us. Our hands, hair, eyes, our very food and the chair we sit on, everything is performing this process indiscriminately. Our Creator is perpetuating this process incessantly with His omnipotence and omniscience. All these movements of the atom and the energy inherent in it are what perpetuate our existence. 2- To Him belongs the dominion of the heavens and the earth. No son has He begotten, nor has He a partner in His dominion. It is He who created all things, and ordered them in exact measure. It is estimated that there are some 1080 particles in the universe. Add 80 zeros after 1 to have an idea of this magnitude. These particles function thanks to complex, ingeniously devised and balanced forces. So do the comets, supernovas and planets, a consequence of the harmonious interaction of these particles. What else must one bring forth to give an idea of the power and design lying behind all these? In this chapter, we tried to outline the structure of an atom and emphasize that it was extremely complex, perfect and ingeniously devised. Were we to push our exploration further, our wonder would be much greater. The emergence of elementary particles in the wake of the Big Bang is the result of an intelligent design. The heat at every instant during the explosion, the number of atomic particles, the forces involved in every stage and their intensities have been carefully planned. Any change in these values would be the end of existence, of galaxies and atoms, and would end up in chaos. The consequence of this primeval explosion was not chaos as might be expected, but a perfect harmony, the work of the Creator, governed by physical laws, a perfect order reigning among galaxies and atoms. Tiny units of split seconds had their function to perform in the creation of the universe. Had the particles and anti-particles been created in equal number, all of them would be destroyed when the temperature fell below one billion degrees, leaving behind nothing but radiation. The very fact of our existence is evidence to the contrary. The number of electrons had to be somewhat more than the number of positrons and the number of protons should exceed the number of anti-protons and the figure representing the neutrons should be superior to the number of anti-neutrons. Every particle had to come into being at a predetermined velocity, temperature and time sequence. The primeval explosion was designed in such a way that it was followed by an evolution that reflected the Creator’s ingenious artistry. We have touched on the structure of the atom and the formation of atomic particles after the primeval explosion. The more one delves into the mystery of creation the more one’s wonder and amazement increase. The actual magnificence of the atom, the creation of particles of the atom by design and the transformation of the particles into atoms are beyond the grasp of the intellect. If 1080 particles, with mutually attracting and repulsing electricity charges, had not been transformed into atoms in a finely balanced manner, neither the human ego, nor the book we read, nor the earth we inhabit would exist. Whether we ascend to the heavens or descend to the microscopic depths, we encounter the same perfection and immensity of God’s work and design. there is therein, and it is He who has power over all things.